Waking up and eating is a joy. I adore breakfast and can’t imagine a day without it, so it pains me that so many people skip this meal on a regular basis. While people around the world are making resolutions to restrict their diets, I’d like to suggest you add something to yours. If you don’t eat breakfast every day, why not make the time to do so? It kick starts your metabolism, limits snacking and overeating and is recommended by pretty much every nutritionist out there. It’s so wonderfully satisfying to start the day with a delicious meal, however small, and the perfect opportunity to try a whole host of recipes and flavour combinations. Fruit and some sort of oats or yoghurt feature regularly on the little loaf breakfast menu and it will come as no surprise that I like to bake my own bread. However I appreciate that yeast is an ingredient that scares many people off and that baking bread is something that usually requires a little forethought. A regular loaf requires several hours between waking and baking with time set aside to knead and prove the dough: not exactly an immediate breakfast solution if you wake up ravenous. This simple soda bread is the perfect solution. With no yeast, no kneading and no proving time, this lovely loaf can be on the table and ready to eat in around half an hour, twenty minutes of which you can get on with making coffee and picking up a paper as it bakes. Made with only wholemeal flour and a mixture of pumpkin, poppy and sesame seeds to add texture and crunch, this loaf is a truly hearty, wholesome way to start your day. We ate this loaf last weekend in our pajamas, mine topped with smashed avocado (I’ve mentioned this obsession before), Carnivorous Fiancé’s hidden under bacon, black pudding and a runny yellow-yolked egg (you wonder where he gets his nickname . . .). We then went in for seconds, slicks of salty butter running over the edges of softly dense and crunchy toast. Sometimes you can find happiness is the simplest of things. After kick-starting 2013 with a drunken plum tart and chocolate-glazed pistachio éclairs, I hope you’ll appreciate the fact that I’ve posted something a little more wholesome here today. As I’ve said before, eating is all about balance and enjoying what you love. Breakfast is what I love: I hope you’ll join me in enjoying it. Preheat the oven to 230 degrees C and place a baking stone or tray in to heat up. Lightly oil a small baking tin. In a large bowl, mix together all the dry ingredients. Add the buttermilk and using a dough scraper (if you don’t have one, your hands will do), mix together for about two minutes until just combined. Flour your hands and the work surface, tip out your sticky dough and shape it into a rectangle. Place in the baking tin, seam side down, slash the top then place directly onto your baking stone (or tray). Bake for 20 – 25 minutes or until the crust is golden and the bottom sounds hollow when you tap it on the bottom. Leave to cool on a wire rack before slicing and eating. Seems we’re both in the breakfast mindset! I often make something very similar to this too – I like mine with ricotta cheese and slices of mango. Or, failing that, homemade jam! This looks so comforting and wholesome – perfect for this time of year. Love your description of the bacon and eggs to go with it. I have a bit of a healthy breakfast and bread baking obsession at moment too and have been making soda bread with herbs and leftover cheese. Your addition of seeds sounds great though. i am firm believer in breakfast. so much so that i’ve managed to convert my hubby. our favourite is home made granola (http://comeconella.blogspot.co.uk/2012/04/on-perfect-granola-lucky-peach-politics.html). my current batch is packed with almonds and black sesame. hubby has his with banana and milk. i have mine on greek yoghurt. bread is a brunch thing and i can’t wait to make this recipe and have it with cheese! This looks delicious, and I love your idea of mashed avocado. One of my new year’s resolutions is to add more avocado into my life in 2013. I love breakfast and breakfast food. This bread does sound perfect for avocado toast! 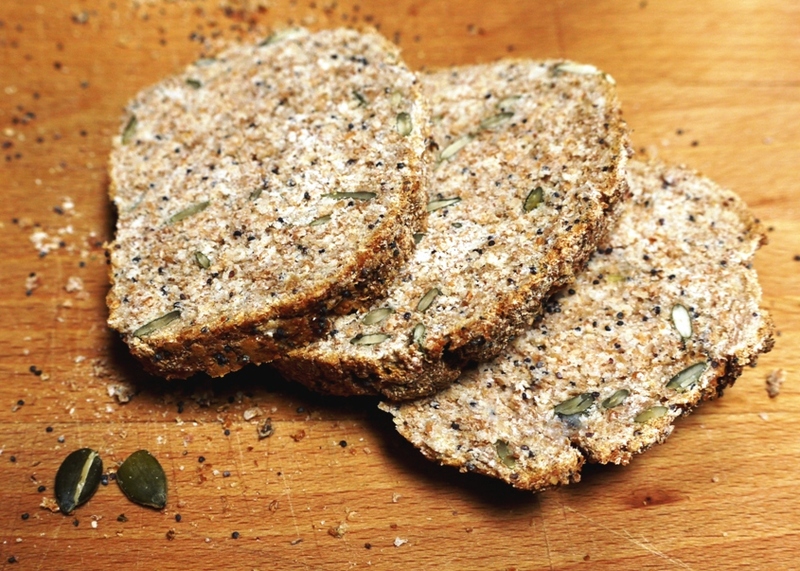 Soda bread for breakfast sounds like an amazing idea! I’m going to have to give this loaf a try this weekend! Like you, I love breakfast and also like to vary it. It’s such a great meal for baking experimentation and practice. I am also a fan of soda bread on occasions. This sounds like a good one. 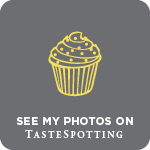 My Dear Bakes – my pleasure, enjoy. Andrea – cheese in soda bread is gorgeous too, something about the texture. Yum. Mehrunnisa – homemade granola is gorgeous. I’m on a bit of a bircher muesli kick at the moment but must make more granola soon! Bianca – it is! It toasts up light yet dense at the same time, so so delicious. Jenny – hope you like it as much as I do. Amy – it certainly is, so many different variations on a theme. So glad to find a fellow breakfast lover. I’m definitely a breakfast lover, too! Although sadly, I only indulge on weekends. This bread looks amazing! I bake mine own, too, every single week. This recipe is so happening this weekend. Pinning! That bread looks lovely. One of my NY resolutions is to try more bread recipes. I am a devoted breakfast eater (weekdays usually mean yogurt) and do not like to start my day with anything sweet. This definitely fits the bill! I don’t eat this kind of bread that often – usually as a treat for stuff like Christmas or Easter breakfast but you’ve got me craving it now. I love seeds in my bread. Wow, wholesome indeed and just the thing for a good breakfast! I love the simplicity of this recipe, I must try this! Looks amazing. I love soda bread. 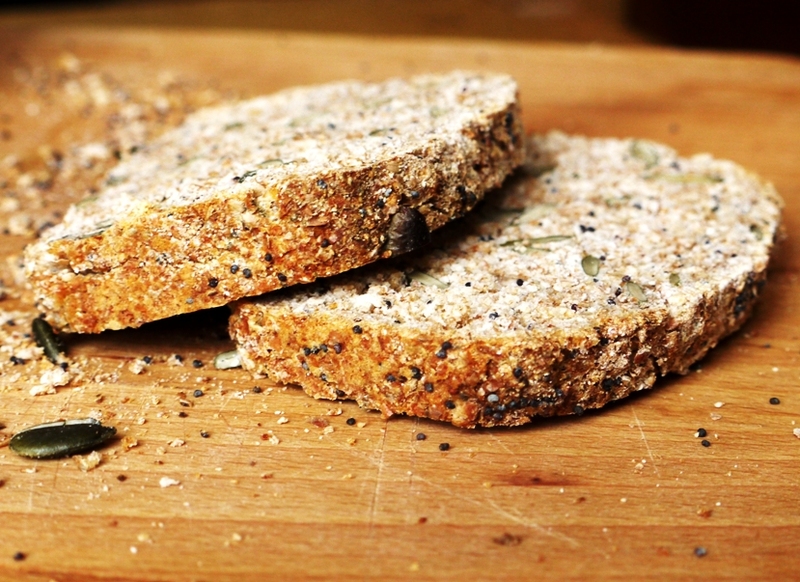 Nickki – me too, it’s so easy to get stuck in a bread rut when you find one that you love. Not that that’s necessarily a bad thing. Eileen – I like a slightly more relaxed breakfast, but each to their own! Sarah – you should definitely make this more often, I’d say it’s an everyday bread rather than a treat! 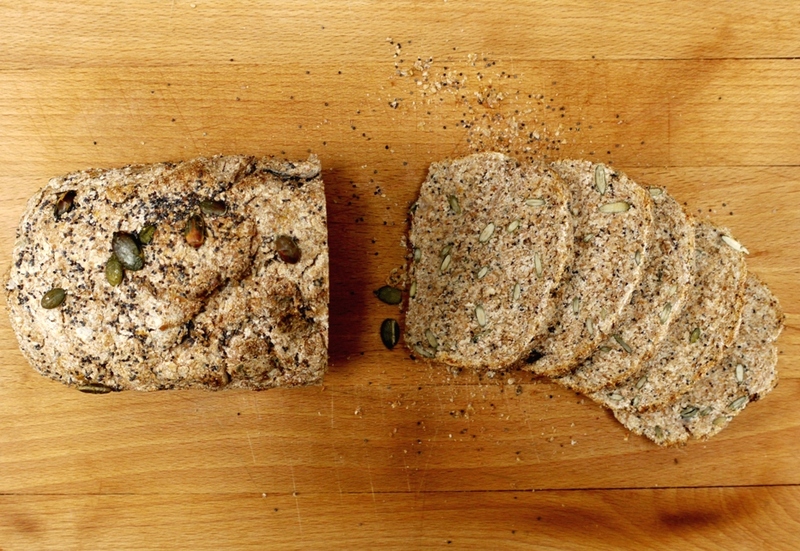 Emiko – it’s so simple, just what I love about soda breads. Very simple indeed! I want to bake some bread this Sunday I think… perhaps a soda bread would be a nice idea. Thanks! It looks really fab! Whole foods are lovely, but so are happy decadent sweets like pistachio eclairs and drunken plum tarts. 😀 I quite like the sound of both of your breakfasts. 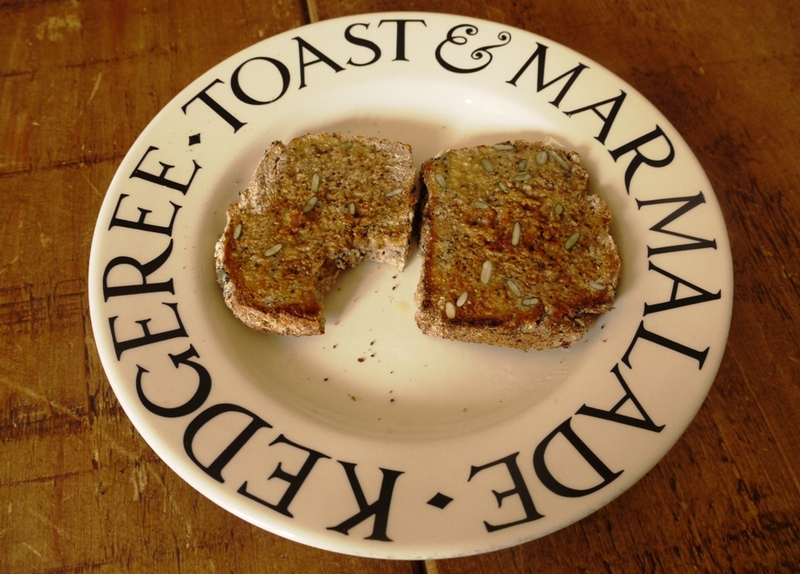 What a lovely way to start the day – my mornings usually involve some kind of yoghurt/fruit/granola combination but I really like the idea of a slice of wholesome bread as an extra treat. Frugal Feeding – hope you enjoyed the loaf! Kathryn – this is a lovely alternative to granola – lots of lovely crunch from all the seeds! The additions to this bread are so many, and whole wheat flour is perfect for breakfast! I´m one who skips breakfast… I should start having dinner earlier, otherwise I get hungry many hours after waking up. The Fabulous Baker Brothers recommend baking powder but both definitely work. 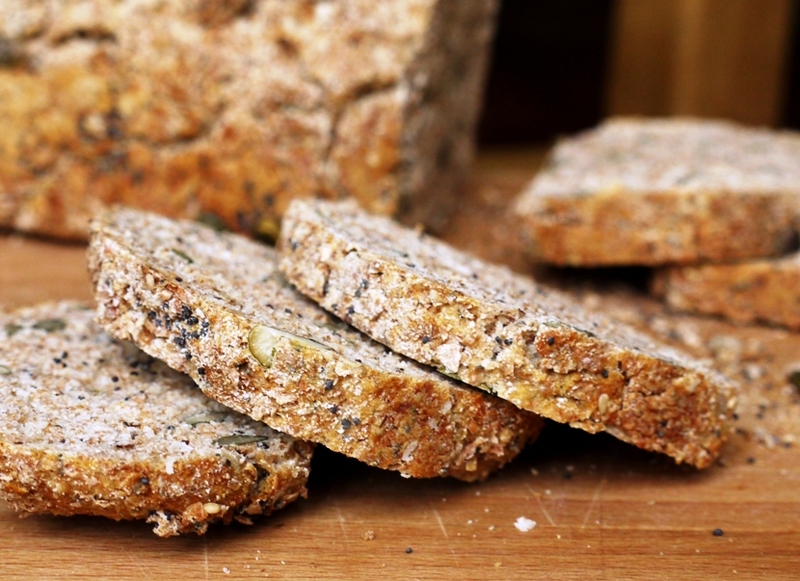 Do try my feta & thyme soda bread too-that’s my favourite! Question how long can this bread keep ? As I will be the only one eating it. Husband is a white bread dude. Hi! I’m bakin it now… Well first it doesn’t really need to “fold” into rectangle as it doesn’t feels like a dough.. And while its baking (now) doesn’t expand.. I used double action baking powder..
Am I doing anything right or wrong?